It is becoming more and more clear that our pets are suffering from eating the standard commercial pet foods. And thankfully for our pets sake more people are switching to a raw species appropriate diet. I wanted to do this also but my dog would not eat raw meat so my homemade high protein dog food recipe is the next best thing. A raw species appropriate diet is the ideal diet for your dog, but there are dogs out there that will not eat raw food. Maybe they are too familiar with processed dry kibble or maybe they have had too many people foods and now their tastes have altered and they don’t find the raw meat appealing. Just like humans can get addicted to pizza, chips or beef jerky that’s loaded with salt and preservatives our pets can get addicted also. So the alternative is to make your own homemade dog food. It is still way better than any commercial dry kibble. This is the standard recipe that I use, I do use alternatives at times, rotating different meat and vegetable options. Place all meat, broth and coconut oil in large stock pot and cook gently on low to medium heat (DO NOT COOK ON HIGH HEAT, it destroys nutrients and enzymes) Steam or boil vegetables separate until fully cooked and mix with meat mixture when all are done cooking. Let sit to cool, when it has cooled to a slightly warm temperature I add the Primal Freeze-dried Nuggets crumbled to small bite size pieces. The freeze-dried nuggets will soak up the juices from the meat and the bone broth. 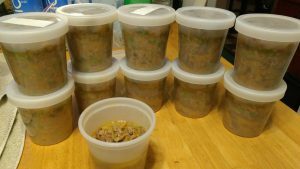 I then divide the mixture to pint size (16oz) freezer containers and freeze. I take them out of the freezer and let them thaw in the refrigerator usually a day in advance to feeding. My dog is 48lbs so he will get just over half the container in the morning and then the rest at night with Missing Link Vitamins every night and 1 raw egg (with crushed shell for calcium) on his food every other night. That equals about a pound of meat per day for my dog. And my vet says he is in perfect health. Some rotations would be to use ground bison or lamb instead of the beef liver, or green beans and sweet potatoes instead of the peas and carrots. Bone broth is a wonderful addition to your dogs diet it provides amino acids and vitamins and is an excellent source of glucosamine and chondroitin for your dogs joints. I use a crock pot for my bone broth and there really isn’t any strict recipe to follow, just take raw joint bones such as knuckle bones or beef or uncured pork hocks (do not used “ham” hocks), turkey, duck or chicken necks, chicken feet (remove the claws) and marrow bones. Place them in the crock pot put in enough water to completely cover the bones and add apple cider vinegar (I usually use Bragg’s Raw Apple Cider Vinegar) about 3-4 Tablespoons for a large crock pot. I cook mine on high until it boils maybe about 2 hours (depending on your crockpot it might take a shorter or longer time) then reduce to low to medium and let cook for about 24 hours. Beware your house will smell so don’t make this before company comes over. I have noticed that the more vinegar you use the longer you will need to cook it so the smell of the vinegar is less noticeable. 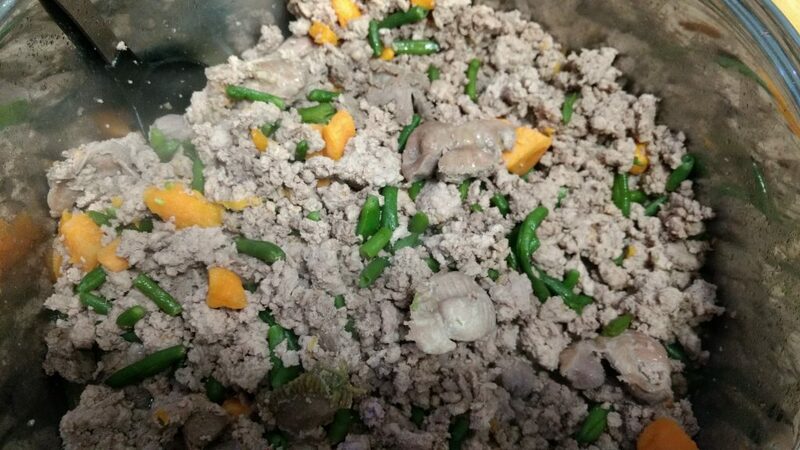 After it’s done let it cool, you can leave the fat that forms on the top or remove and discard it, my dog is very active so a little extra fat is not a worry for me, I place it in the 16 oz freezer containers and freeze until I make the next batch of dog food. I have also used this as a topper for the cats food as well, all my fur babies love it. The ideal diet for your dog should be approximately 80% muscle meat, 10% organ meat, 5% bone and 5% vegetable. Most commercial kibbles fall short and do not meet these criteria. If you are unable to feed raw or make your own then try to supplement with some extra meat (no spices) from your meal that you didn’t eat and give sliced carrots or apples as treats. I would be careful with feeding food prepared for humans because we tend to be heavy-handed with garlic, salt, pepper and other spices that might not be the best choice for your dog and may actually harm them. Whether you choose to feed raw or cooked, home made or store bought be sure to get as close as possible to your dogs natural diet. Disclosure – I get paid commission for purchases made through the affiliate links in this post.We are a participant in the Amazon Services LLC Associates Program, an affiliate advertising program designed to provide a means for us to earn fees by linking to Amazon.com and affiliated sites. 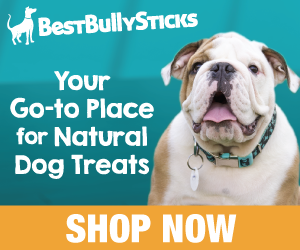 I am always looking for a better food for my dogs. Thanks for the recipe I hope to try it soon. You are welcome and thank you for leaving a comment, my dogs health has really improved since I switched to this homemade food. He used to get allergy shots once a month because he was always itching, he would always have bald spot even though I was feeding a high quality grain free, human grade dry kibble. Now he is not getting any allergy shots and his coat is nice and full and soft. My vet says to keep doing what I’m doing. Any ideas if this would work for cats? Especially if the cat likes to try all the new stuff. Yes this would be a good base diet for cats as well, however I would add more dark meat chicken. Cats need more taurine and that is found naturally in dark meat chicken and organ meat like chicken livers. And the “Missing Link” supplement should be the one specifically for cats. Be sure to check with your own vet to make sure they approve this diet, I am not familiar with your cats health conditions or overall health. 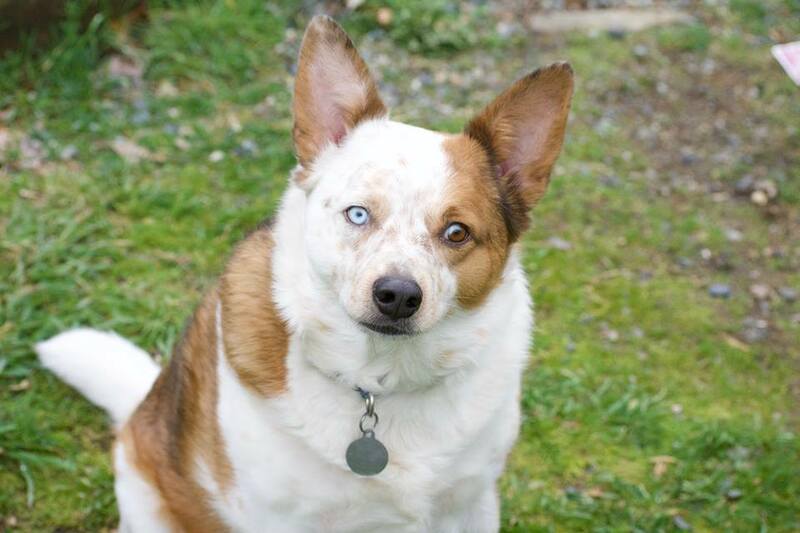 As an avid dog lover myself, I love your site and especially this post. I am always careful to try and give the best for our dogs. You are what you eat. I will be trying the Bone broth because it provides amino acids and vitamins. Thank you for reading my post, my vet has given her blessings on this recipe. When I made the bone broth the chicken feet were so soft I actually could have fed them to the dogs. I may go ahead with that next time (The bones were so soft I could just smash them between my fingers) Best wishes for you and your dogs, I’m glad you enjoyed my post. I love this idea of cooking fresh food for your dog! I’m going to share this with my friends who are dog owners. I often wondered if bagged, store bought dog food is any good for someone’s precious pet. It looks so unappetizing. I love your site! I wish I had access to this back when I had cats!